At Deluxe Blog Tips, we have some guest posts from JayKrishna Yadav. In the end of each guest post, I display his name, bio and gravatar to let people know more about him. That author bio box is supported by Genesis framework, which I’m using for Deluxe Blog Tips. If you want to use the default Genesis author bio box, you have to create an user for your contributor, and fill in his bio. That’s good enough unless the contributor wants to show different bio in author bio box each time he writes a post, like JayKrishna Yadav does at Deluxe Blog Tips. In this post, I’ll show you how to do that with a simple meta box and a few lines of code that will replace Genesis author bio box with a custom one. I register a meta box with 3 fields: Name (text), Email (text) and Bio (textarea). The email will be used to show author’s gravatar. 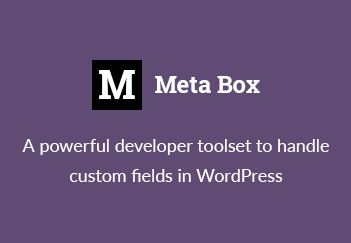 If you don’t know what the code means, please look at see how to register meta box and how to define meta fields. In this function, I use the helper function of meta box plugin to retrieve author information, and then pass that information to a predefined $pattern variable, which holds the HTML structure for author bio box. This makes the guest author bio box looks exactly like default author bio box. That’s all. Let me know what you think about this method in the comments below. And if you want to do guest post at Deluxe Blog Tips, please contact me. Thanks!That is very helpful.I never tried adding an author bio before.Great that I found your post! Thanks a lot for your code snippet. Really useful for me. Thanks a lot. This worked and helped. How can I make more use of the meta box plugin? What other wonders can it do? I’d be glad if you can enlighten on this aspect. Thanks again. Hi thanks for this awesome post but how do I make all the outbound links as “nofollow”? I mean the ones which are inside the author bio box? so nice is your blog! Really love it! Great Article. It’s very helpful to me. Thanks!! What modification can be done in this code to make it compatible with the non Genesis themes? Can you please hepl me, I am awaiting for your reply.